Female 69 years. Recent onset of persistent diarrhoea. Normal endoscopies 2 years ago prior to symptoms. 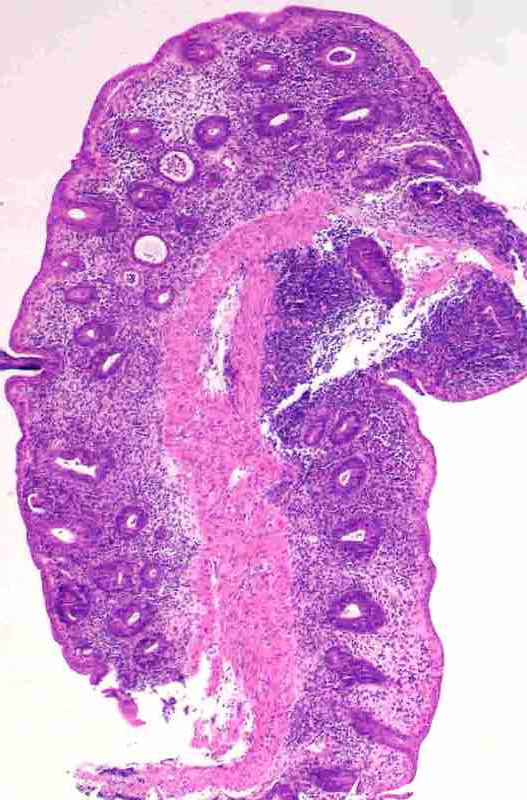 Endoscopy findings: Patchy ulceration in duodenum, patchy erythema in colon. 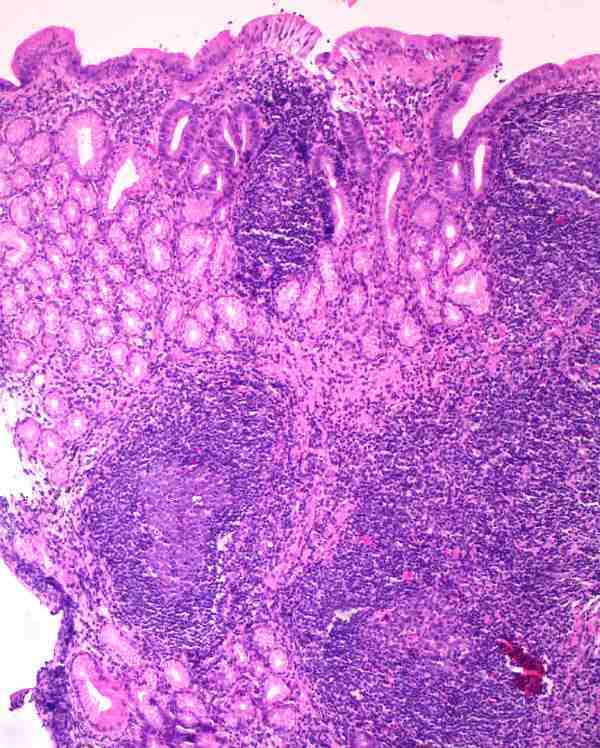 Autoimmune enteropathy secondary to thymoma. The patient had a recent diagnosis of thymoma. Thymoma is well described to be associated with paraneoplastic autoimmune diseases. Chief amongst these are myasthenia gravis, haemolytic anaemia, SLE, bullous pemphigoid, dermatomyositis and SIADH, however, virtually any autoimmune disease may develop. Relevant to GIT pathology is 1) the association with autoimmune enteropathy, initially described as a GvHD like colitis but more recently realised to me a more generalised process in some patients; and 2) the development of, or exacerbation of, ulcerative colitis. In both instances, thymectomy is the treatment of choice. The pathogenesis of autoimmunity is not conclusively known. An acquired abnormality of T cell function is present and perhaps development of T regulator cell dysfunction is mostly responsible, although other T cell subset defects exist. 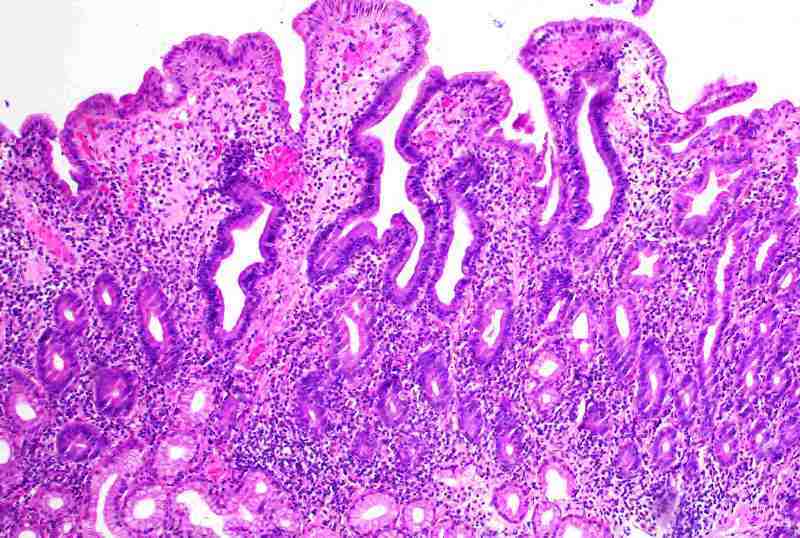 Autoimmune enteropathy only rarely presents de novo in adults. Thymoma is the most common underlying condition, when one is found. 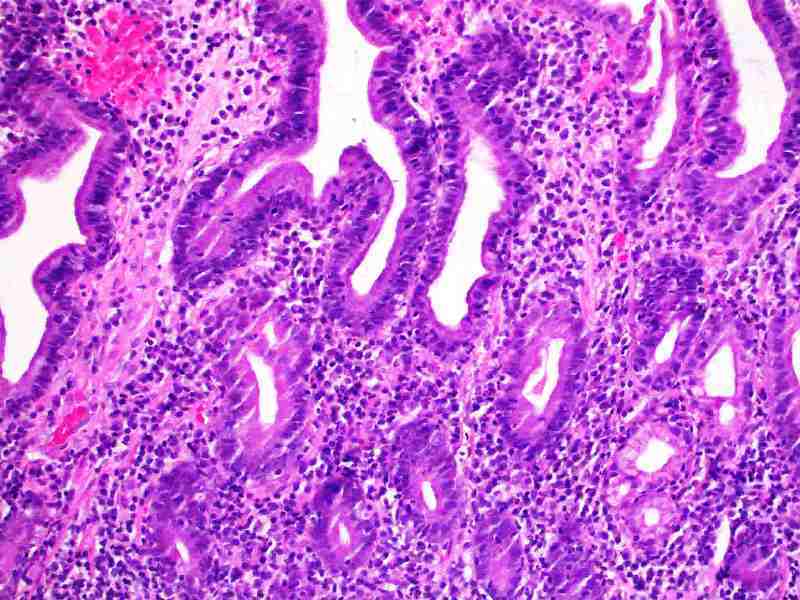 A subset of common variable immunodeficiency also presents as autoimmune enteropathy but usually in adolescence. 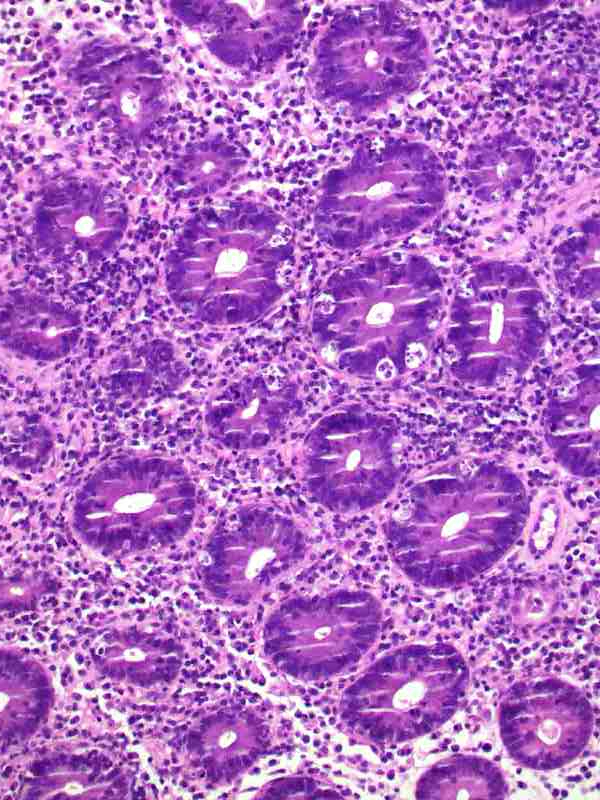 Thymoma associated colitis typically resembles GvHD with marked crypt apoptosis (apoptotic colopathy). Other causes of prominent colonic crypt apoptosis are listed below. In older patients – drugs, treatment of malignancy and thymoma are most common. Active chronic inflammation - often very marked with ulcerations. May be a mimic of crohn’s disease or ulcerative colitis. Mixed patterns – showing various combinations of the above. It is worth noting that the patterns seen may vary between the various sites of involvement in a patient. 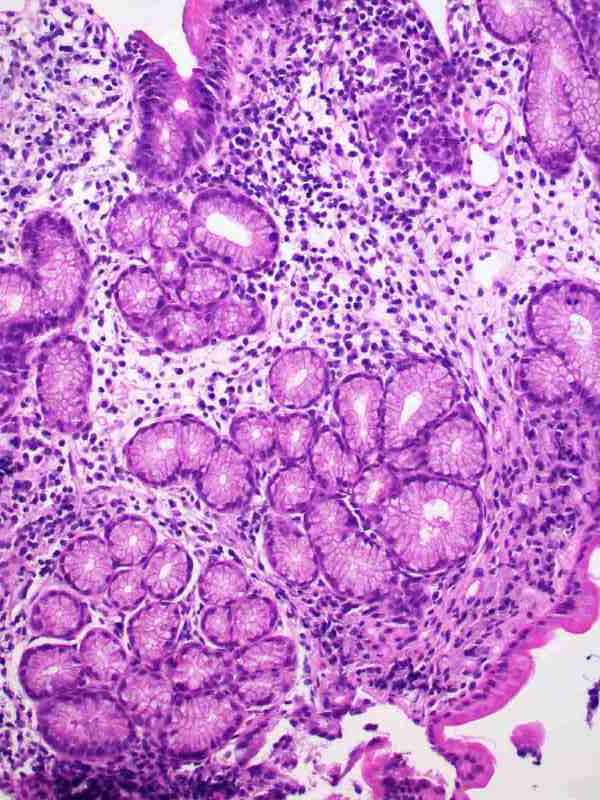 As demonstrated in this patient, the duodenum has active chronic duodenitis and some intraepithelial lymphocytosis while the colon resembles GvHD.